Yes, there is life outside of Metro Phoenix, and some of our survivors work/worked there and live there...and it's pretty darn good! 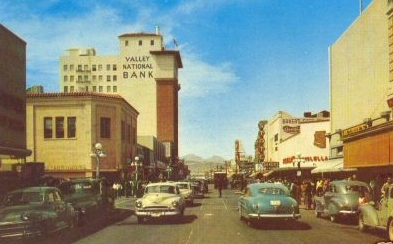 Your Humble Webmaster grew up in Tucson and worked at a bunch of TV and Radio stations there in the 50's and 60's. No doubt, this was the golden age of television. LIVE television. No tapes to cover up mistakes...but, fortunately, we never made any. 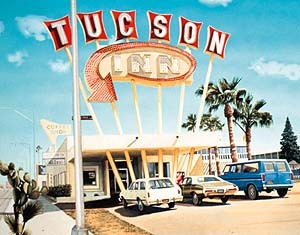 Want to hear some old Tucson Radio? 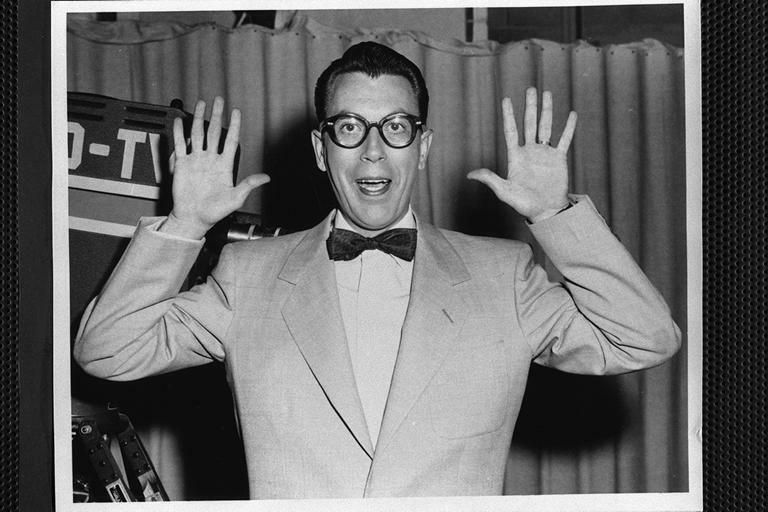 Listen to Chris Borden on KTKT in 1959, Click Here. 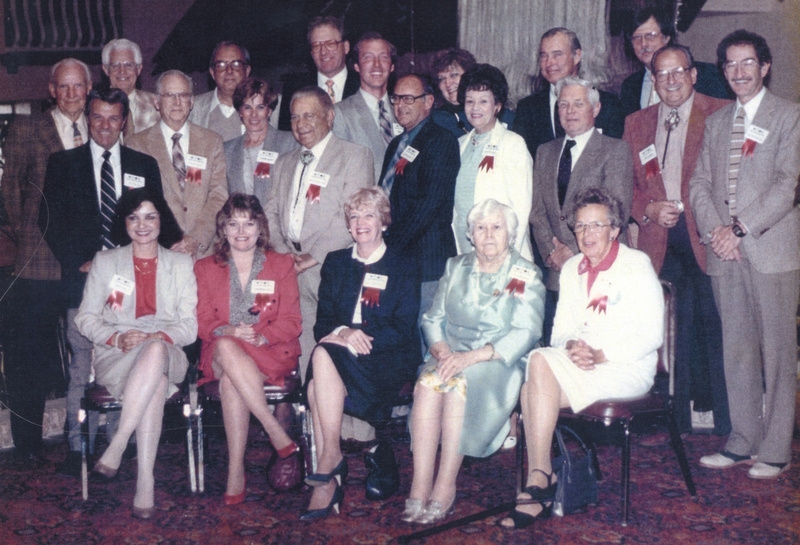 Listen to John Mac Flanagan on KTKT in 1969, Click Here. 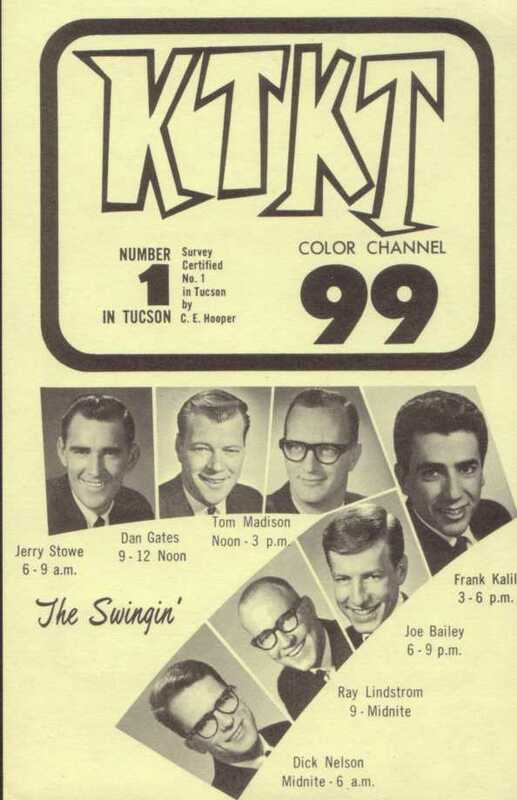 Like to see how much radio advertising cost in Tucson in 1964? Take a look at a local KTKT rate card, just Click Here. How about a great old-time radio story about the early days of broadcasting in Yuma by the legendary Ray Smucker. Click here and take a look. 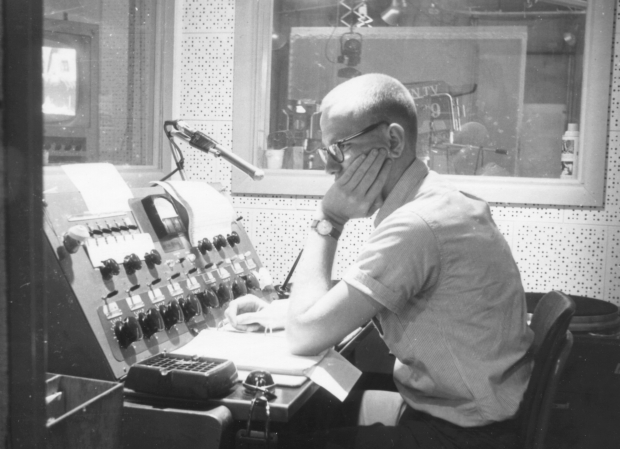 Left: Andy Wilson in the studio, one of the first TV announcers in town. 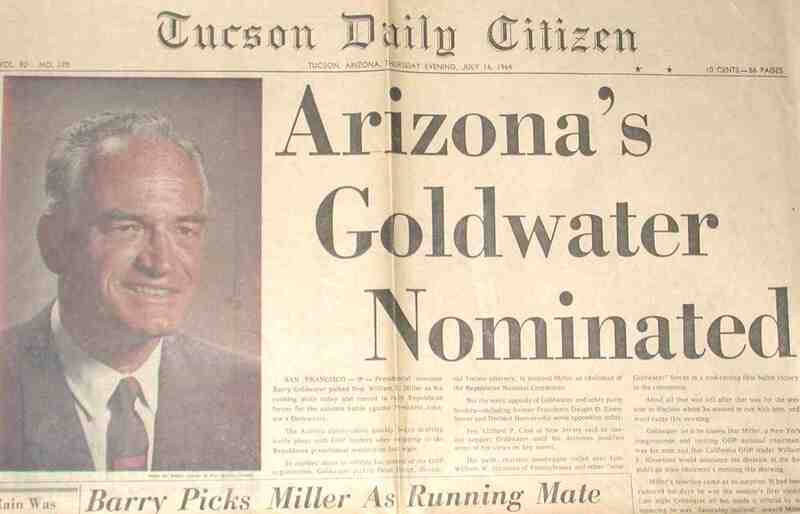 Just a few months after KOPO, KVOA-TV, NBC, channel 4 signed on the air. Left: A typical "talking head" panel show complete with the requisite drapes in the background. Every station used drapes for a background. A couple of scoop lights, and a boom mike, and you were ready for action. 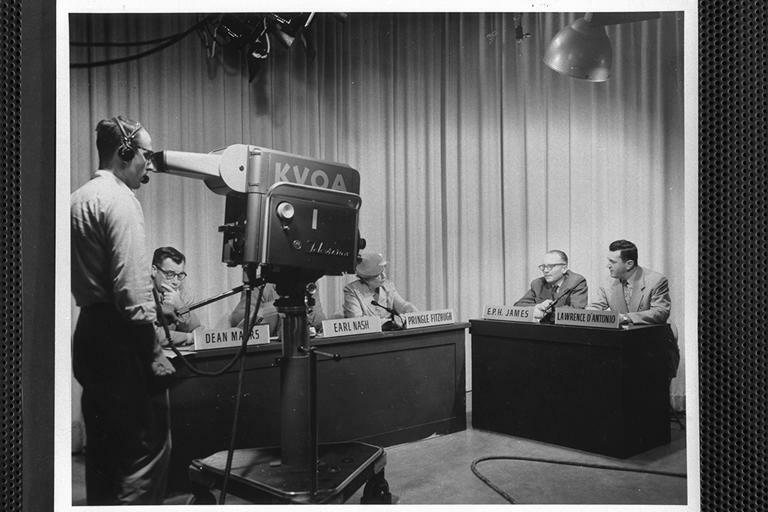 The announce/audio booth at KGUN-TV, channel 9, in 1960. You can look through the window and see the cameras in the studio. There were 3 sources of local audio: ET (electrical transcription-remember those? ), SOF (sound on film), and live mike audio. No tape...not video, nor even audio in 1960. Every station break was live! 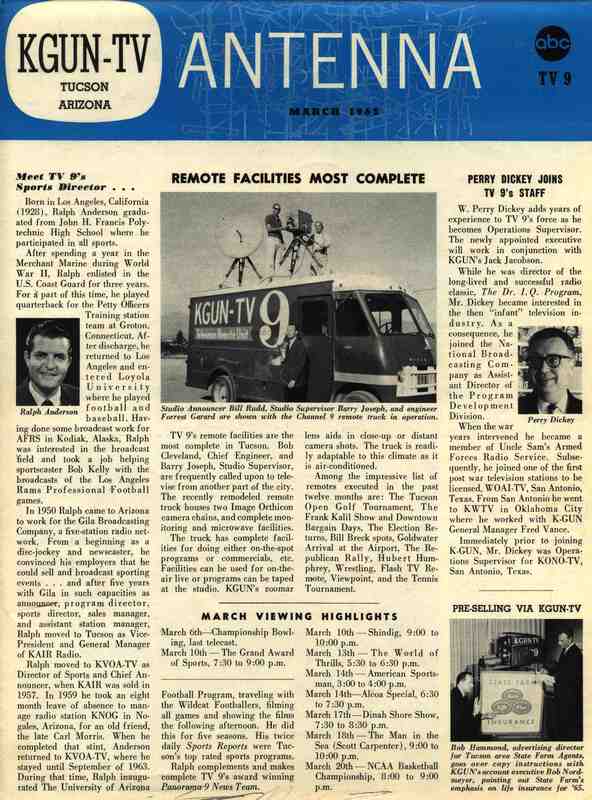 These were the 3 TV stations in Tucson in the 50's and 60's. 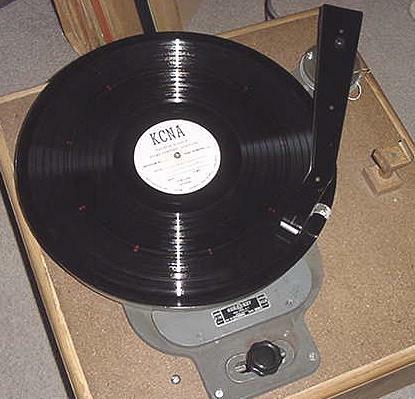 KDWI was the last of the original network stations to sign on in 1956. The call letters were changed within 2 years to KGUN-TV and they became an ABC affiliate. The 3 stations all had two black and white cameras in the studio. 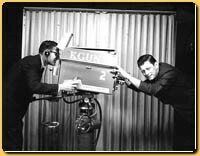 KVOA had RCA, KGUN had General Electric, and KOLD had Dumont with the focus knob in the handle. The KOLD cameras were actually on old fashioned tripods on wheels. Looks a little different than today, but, then, it was the state of the art. 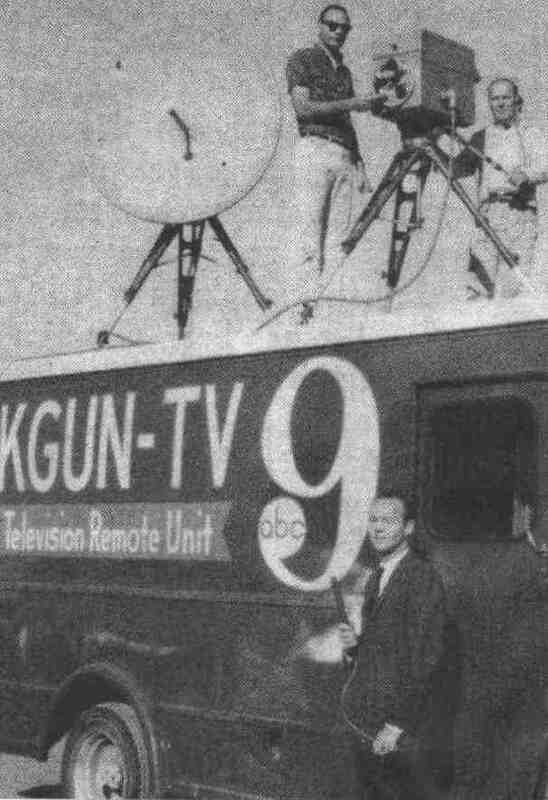 KGUN-TV proudly introduced this unit in 1965. For the details you can read the front page of the company newsletter, KGUN-TV antenna, just click here. 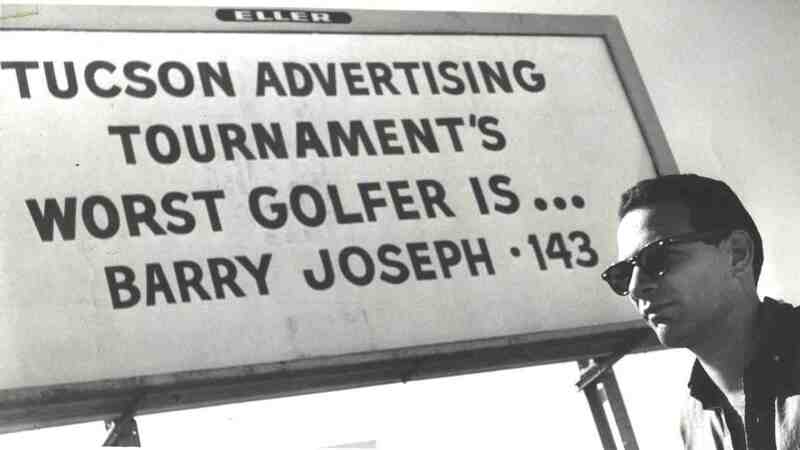 Thanks to former KGUNer Barry Joseph for these historical items, who was not to proud to show us he was the "Worst Golfer in Tucson" in the late 60's, below. 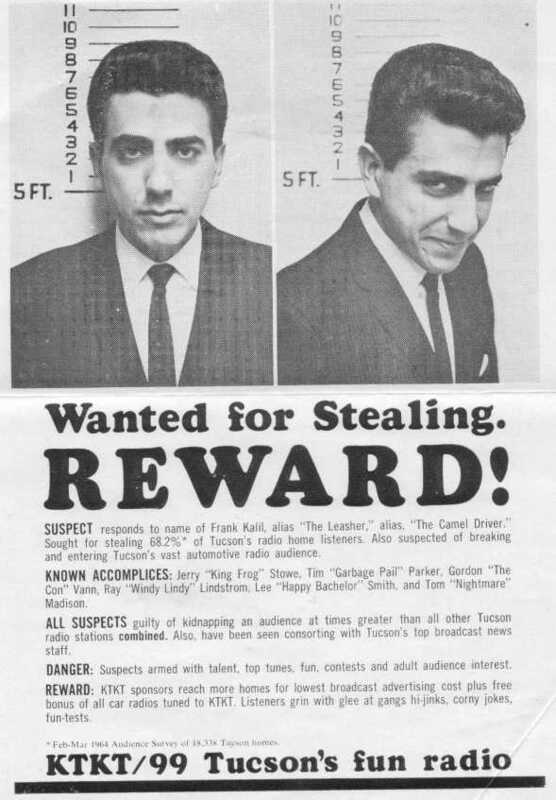 Above: Legendary rocker KTKT ran this ad in Tucson newspapers in 1964. It featured their number one deejay and program director, Frank Kalil. 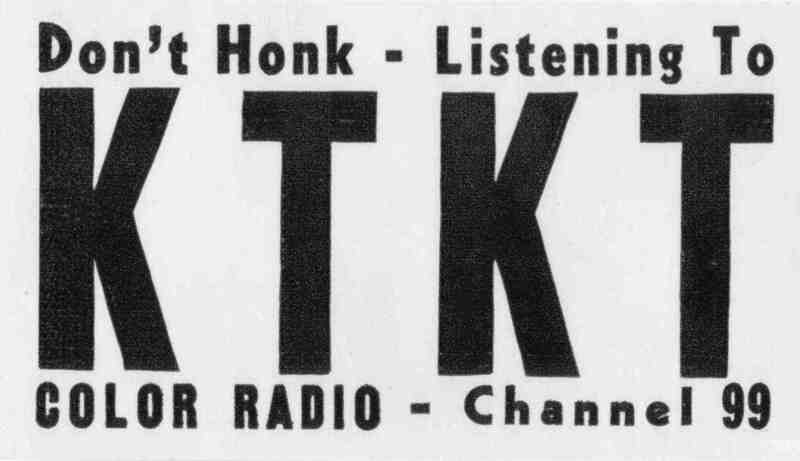 Left: KTKT hit sheet from Oct. 8, 1965. 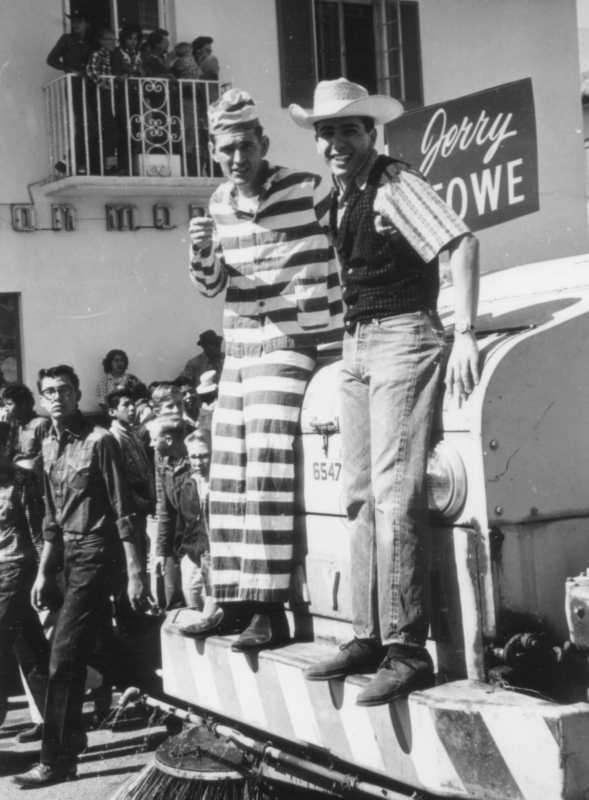 Right: KTKT jocks Jerry Stowe and Frank Kalil ride the street sweeper at the end of the rodeo parade, 1964. KAIR was a low power 250 watt station that changed format frequently. 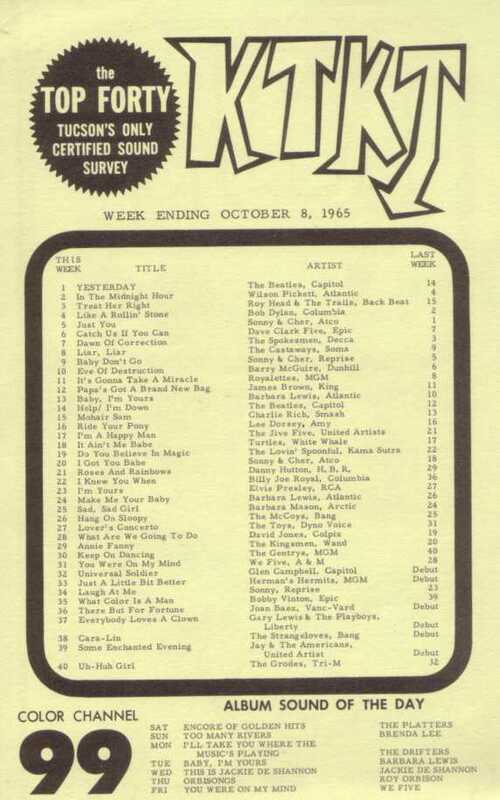 In April, 1961 they were top forty after switching from first country, and then easy listening. One of their "Swingin' 60" hit sheets is shown on the left. (Click to enlarge). 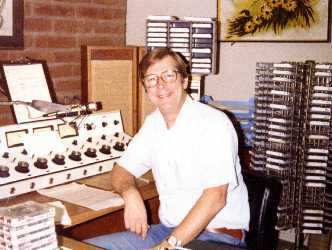 Left: Jake at KAIR radio in 1980. 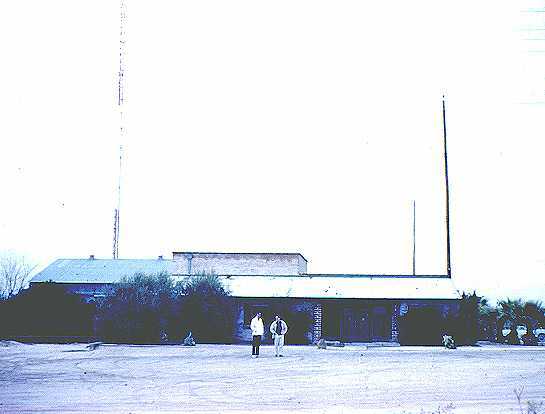 Left: The old KVOA channel 4 studios in the snow, circa 1961. 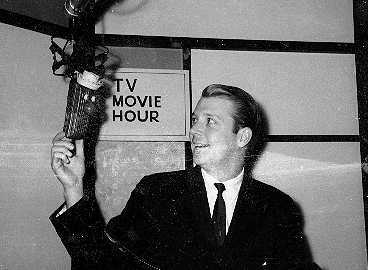 Right: Jake as host of the TV Movie Hour on Channel 4 in 1963.